have begun to install variable frequency drives (VFDs) to monitor and control the speed of their irrigation pumps powered by electricity. The questions that were answered recently are: Should VFD be installed on all electric motor power irrigation pumps? and, Will they pay for the expense of VFD installation? VFDs are electronic monitor and control systems that alter the speed of pump rotation by adjusting the frequency of the electricity delivered to the motor. It turns out that the motor cares little about what frequency the power is and the speed of the motor changes linearly with the change in frequency. So if one wanted the motor to run at 1650 rpm, one would adjust the frequency of the electrical supply from 60 Hertz down to 56 Hertz [1650 ÷ 1770 x 60]. When the pumping plant is designed for a center pivot installation, the pump impeller is selected that will deliver a desired flow rate and pressure to the highest elevation in the field with all sprinklers in operation. The final criteria is that the impeller operate at near maximum efficiency. Irrigated fields have some level of elevation change, but since the design is based on the worst case scenario most of the field will receive greater pressure and flow rate than the system was designed for. Enter VFDs. Dilshad Brar, a graduate student in the Biological Systems Engineering Department, looked at 1000 center pivot installations in 10 Nebraska counties to determine if placing a VFD on the system would be economical. A standard length center pivot with 8 towers was superimposed on each field’s digital elevation map. The hydraulics of the systems were calculated for a set flow rate and diameter of pivot pipeline. 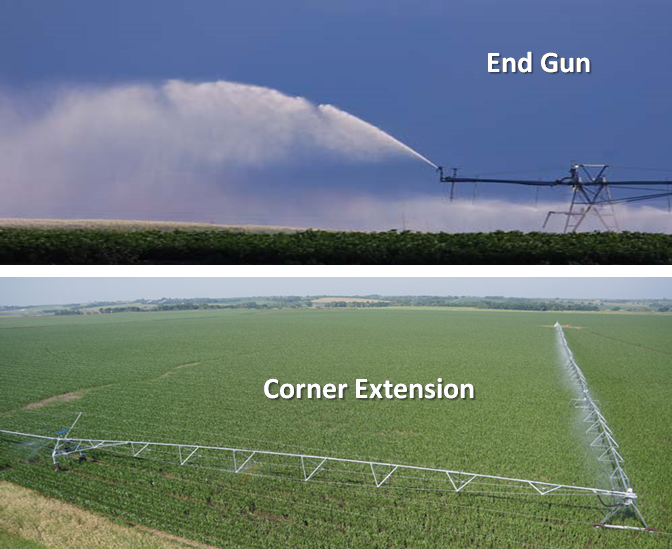 For scenario 1 the center pivot system did not have an endgun. Despite the rolling terrain in some of the counties, use of VFDs resulted in less than $0.25 per hour savings in energy cost. For the systems evaluated, a VFD would not pay for itself over a 15-year life. For Scenario 2 an endgun (Top photo below) was installed at the end of the center pivot pipeline. Addition of the endgun improved the economic situation somewhat. The reason is that the endgun does not operate for the full rotation of the center pivot. Most designs have the end gun turned on for 40 degrees in each corner. So the endgun is operating for 160 degrees out of a 360 degree revolution or 44% of the time. Use of a VFD could reduce pumping costs by about $0.70 per hour. Still not economical for most center pivot installations in Nebraska. In Scenario 3, a corner extension (bottom picture below) was added and the flow rate changes substantially when the added pipeline is fully extended in the corner. The additional flow rate required by the 350+ foot extension results in increased friction loss in the main portion of the pivot. In most cases the corner extension is totally functional for only about 20 degrees in each corner or 22% of the revolution. The remainder of the circle experiences a gradual change in flow rate as the extension moves into and out of the corner. Thus, the pump impeller selection is based on a flow rate requirement for less than 22% of the system rotation. With the addition of the corner extension, added friction loss resulted in conservation of about $1.60 per hour of operation by using a VFD. For Scenario 4, an endgun was placed on the end of the corner extension. In this scenario the endgun functions only about 9 degrees out of each corner. The size of the endgun determines how much energy could be conserved if the pump impeller speed is adjusted based on the need of the center pivot. For Scenario 4 the energy cost savings when using a VFD averaged about $3.00 per hour. Overall, our results indicate that an electric motor running at a constant 1770 rpm will use excess energy for much of the center pivot revolution. VFD operation includes the installation of a pressure sensor somewhere on the system. The controller part of the VFD adjusts the motor speed to maintain a set pipeline pressure wherever the sensor is positioned. Some sensors are placed at the pump outlet, but if the irrigated area has a lot of topography, that position is often the worst location for the sensor. Center pivot manufacturers have developed options to place the pressure sensor somewhere on the center pivot. Part of the work evaluated where the pressure sensor should be located to achieve maximum energy conservation. Approximately 50% of the field sites included in our study resulted in the best pressure sensor location being near Tower 8. For 20% of the systems the best place was near Tower 7 and 15% of the systems should have the pressure sensor located near Tower 6. Results point strongly to evaluating each center pivot installation separately to determine where the sensor should be placed on the center pivot.